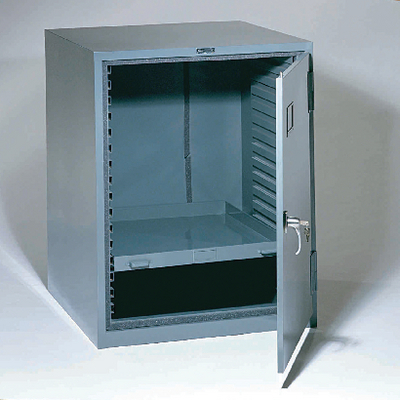 Rugged, welded-steel construction and specialized features make this cabinet the most durable choice for storing your valuable scientific collections. The cabinet features a unique “lift off” door that’s easily removed from its hinges to enable transfer of many drawers at a time. The door also features a elastomeric seal for airtight storage, locking handle, and chrome label holder. Powder-paint finish. It will accept up to 16 storage trays. Size: 29"W x 32"D x 36 7/8"H. Weight: 134 lbs.